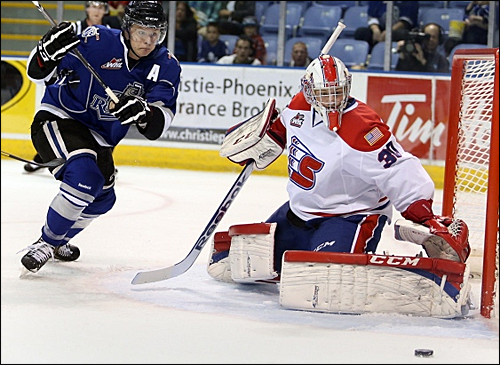 The Spokane Chiefs announced Wednesday that 20-year-old goaltender Garret Hughson had been released. Hughson (6'3'', 195 lbs) is from Foremost, Alberta, was entering his fourth season with the Chiefs. He served as the backup goaltender to Eric Williams for two seasons before earning the starting nod in the 2014-15 season. Last year, he went 23-23-4 with a career best 2.80 GAA and .902 save percentage. He finishes his Chiefs career with a 41-38-5-2 record, a 3.07 GAA and .895 SV% with 4 career shutouts. Entering 2015-16, his 20-year-old overage season, Hughson was expected to be a consistent force in net but struggled out of the gate, going 0-2-1 with a 5.44 GAA and a .833 SV%, allowing 17 goals in 4 games. Hughson's release makes him eligible for the WHL 20-Year-Old Cutdown Waver Draft, which means the other 21 clubs can claim him if they're interested. If he isn't claimed, he'll become a free agent, making him eligible to play in other junior hockey leagues. The move leaves Spokane with only two 20-year-olds on their roster, which means the club may claim someone off wavers or keep the spot open in case Helewka is re-assigned back to Spokane. Hughson's release also opens the door for 18-year-old Tyson Verhelst and 17-year-old rookie Matt Berlin. Verhelst, who likely will be the starter, has played in 5 games this season, posting a 3-1-0 record with a 2.56 GAA and a .921 SV%. Last season, Verhelst was 11-11-0 with 3.65 GAA and .883 SV% in 26 games. In the team's press release, Chiefs General Manager Tim Speltz commented, "Garret took great steps as a person and as an athlete during his three years with our team. We want to thank him for his contribution. We feel, as an organization, that we need to commit to Tyson Verhelst and Matt Berlin as our goaltenders for this season and our future. 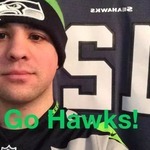 The Spokane Chiefs wish Garret all the best moving forward."